How The Catholic Church Built Western Civilization by Thomas E. Woods, Jr.
A Catechism of Church History 4th Edition by Fr. Robert Fox - Catholic History Book, Softcover, 290 pp. St. Joseph, As Seen by Mystics and Historians by Dr. Rosalie Turton - Catholic Saint Book, Paperback, 450 pp. Angels in Iron by Nicholas C. Prata - Catholic History, 313 pp. He Leadeth Me, by Walter J. Ciszek, S.J. St. Joseph Church History by Rev. 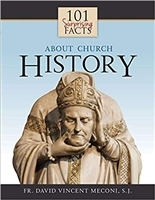 Lawrence Lovasik - Catholic History Book, Softcover, 192 pp.